ARO Calicut Army Bharti Rally 2019 Apply for Soldier Gd/Clerk Vacancies, Indian Army Rally in Kerala, ARO Calicut Army Recruitment Rally, Indian Army Physical, Medical, Examination Date, Latest Army Bharti, Upcoming Army Bharti Notification, District Wise Army Rally List, Centre Army Bharti, Relation & Sports Quota Army Rally. ARO Calicut Army Bharti Recruitment 2019: We inform you that the Indian Army (ARO Calicut) recruitment department issued a notification for Soldier General Duty, Clerk & Tradesman etc vacancies. Candidates who are interested in the Indian Army Service or belong ARO Calicut unit can apply online application form before the last date given below. All covered state candidates can join the recruitment rally with their original document like as domicile certificate, 10th, 12th marksheet, Relation & Sportsman certificate (if any). 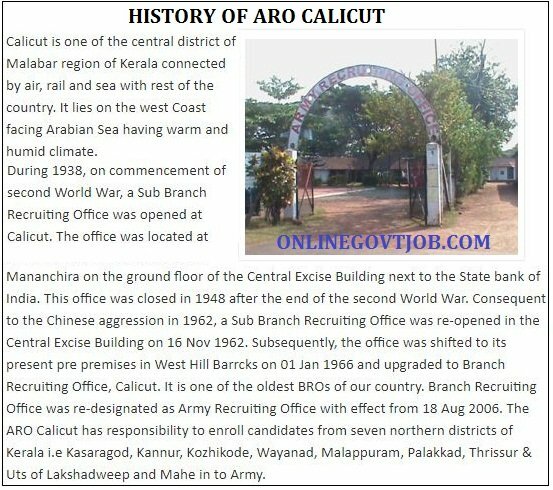 If the candidate wants to know more about ARO Calicut Army Bharti recruitment or Regimental Centre or Relation/Sports Quota army Bharti details like Age limits, Qualification, Physical steps, candidates joining process, State/District wise Army Rally Date, Relation or Sports quota bouns marks, explained below in details. ARO Calicut Army Bharti Rally Admit card – Print Out admit card form Indian army official website after some days registration application form. The candidate must have the 12th pass (Arts/Science/Commerce) With 50% in each subject and 60% marks aggregate subjects for registration ARO Calicut Army Bharti Rally Application form. Should have studied English and Maths/Accounts in Class 10th or 12th. The candidate must have pass 12th class with Physics, Chemistry, Biology, Mathematics and English with 50% aggregate subjects and 40% marks in each subject for registration ARO Calicut Army recruitment technical post. The subject of biology is only necessary for the Army Military Nursing Assistant post. Candidates should be physically fit to join the Indian Army. The primary point for physical fitness testing in the Indian Army is the race. Mainly run physical tests, Long jump, high jump, run for the full test. The physical fitness test is the main point in the process of joining the Indian Army. The names of the candidates passing in the physical examination ARO Calicut army rally recruitment are kept in the merit list. Email Id (ईमेल आईडी): Each candidate must have a personalized email ID. Instructions regarding shortlists, call letters, any type of exam, instructions for changes in the physical fitness test date, examination results, merit list etc about of ARO Calicut Army Bharti. will be sent by the Indian Army Department on Email id. Mobile Number (मोबाइल नंबर): Because of the OTP key and other personal messages sent to the mobile number of the candidate by ARO Calicut Army Department. Details about your address like as State (Kerala), District wise ARO and Tehsil/ Block of Domicile. Now you can fill your ARO Calicut army Bharti rally registration form or application form with full details and choose your Indian army posts. Our web portal onlinegovtjob.com is not responsible for any query or mistake. So suggested to candidates that please check also official website notification for ARO Calicut Army Bharti Rally Recruitment. For sepoy pharma no vacancys?